This injury is a result of acute trauma to a clenched fist, usually acquired during contact sports involving force with the hands. Symptoms of Boxer’s fracture may include pain or tenderness centered in any given location of the hand corresponding to the metacarpal bones. Some patients may present with misalignment of the associated finger. This injury occurs commonly during fist fights or from punching a hard object. In most cases, the fighters are inexperienced and did not have the proper form when sparring, causing the fracture to occur. However, one can also sustain this injury in other ways not related to punching. Other causes can be from trying to break a fall with your hand, violent twisting of the hand or finger, or from contact during sports. Most injuries are easily distinguishable due to swelling, deformity to the region, contusions, or being in an incorrect anatomical position. X-rays may be required to determine the severity of injury to bones or ligaments. Patients may present with swelling and discoloration in the affected region caused by direct trauma to the bone and surrounding ligaments, tendons, muscles, blood vessels, and nerves. Decreased ability to move the hand in the usual directions and manner may result from the swelling or pain associated with the fracture. The little finger’s metacarpal can tolerate more angulation than the other metacarpals because it can compensate with its greater mobility at the joint at its base and due to the hand’s natural curvature. Consequently, most fractures with or without mild angulation can be treated with simple immobilization in a brace or cast. Protect: The injured area should be protected with a splint, brace, or crutches. Rest: Rest the injured area. Ice: Cool the area with a cool pack or ice bag to help with swelling and pain. Compression: Compression limits the amount of swelling that can occur. Elevate: Elevating the area also helps control swelling by reducing the amount of fluid that goes to the affected area. More severely angulated fractures may benefit from surgical realignment and stabilization to improve hand mechanics and the range of motion of the finger. If surgical intervention is required, Boxer’s fracture can be treated with closed reduction and stabilizing the proximal part of the metacarpal dorsally. A short arm gutter-splint will be used with flexion of the metacarpophalangeal joint, typically for 2-3 weeks. This is followed by buddy-strapping until the injury has resolved and physical therapy can begin to improve range of motion. 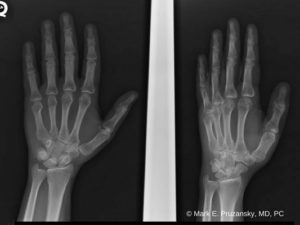 With proper immobilization of the broken bones and good follow-up with a hand specialist, most people with a boxer’s fracture have a good prognosis. Patients requiring surgery often have a longer period of recovery than those whose injury can be treated with conservative measures. Physical therapy is recommended to try and regain any loss of function and range of motion in the affected region. Please contact us as soon as possible to schedule an appointment with our talented team. People experiencing a boxer’s fracture should be evaluated to try and reduce the risk of further injury and mobility issues. If you have been injured, it’s important to be evaluated by a highly skilled hand surgeon. Call Dr. Mark Pruzansky and Dr. Jason Pruzansky at 212-249-8700 to schedule an appointment and obtain an accurate diagnosis.